Sleep to Live Institute used their analytic data model to give us a data-driven recommendation for mattresses that would give us the best sleep possible. Utilizing this data, we found the mattress that would meet both our needs. Feeling empowered by the analytics we were finally able to come to a fast decision. 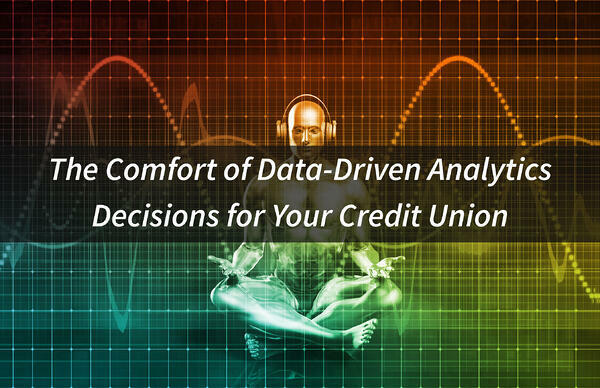 A new era of data analytics is transforming the credit union industry as well. While our sleep health was important to us, we’re just as concerned about our financial health. Strong data analytics and integration are key to providing critical modern services for members. A positive experience can convert a customer for life and will establish a strong level of trust with their credit union. Just as my wife and I were initially confused in the investment decision of a new mattress, many credit union members are confused when it comes to making decisions to improve the financial health of their family. They have tried a lot of products by how they “feel” and what they have heard from friends and other unofficial sources. Unfortunately, just like buying a mattress, the decisions made on financial products have consequences and members have to lie in the bed they made (pun intended). Credit unions should be collecting data from members to improve their financial health. When members interact with their credit union, they should be able to enter their financial goals and pains for a personalized output. The good news is, credit unions have the “sensor data” of members’ financial lives, and it is located within the transactions that members have been conducting on a daily basis. By integrating transactional data and member-input data, with the guidance of a member-centric data model, product recommendations can be presented to members in a comforting experience. Credit union data analytics and data integration are key to providing the kind of member-centric services that are the hallmark of the credit union industry. Everyone should enjoy the kind of comfort that data-driven decisions can give them. If a small, community mattress company has the technology to help me and my family sleep better at night (pun again! ), why shouldn’t my credit union have the same?